Blog | Dorina's Kitchen | Let's get BACK TO THE TABLE! Back in 2006 when we were living in Roseto for the year, we got to see and do things that we don’t see when we just visit in the summer months… like go wild asparagus hunting on the mountain!!! So out we go on this beautiful spring day to get some “asparagi”. This is a photo of my son Tino with the first ones we found! Can’t you tell how excited he was? I will tell you the kids were MUCH more excited about finding them than me taking their picture with a handful of asparagus! But come on!!! I just HAD to document that whole year! It was amazing! Better than this pic tho was the beautiful frittata I made when we got home with fresh eggs, the best parmigiano cheese and that handful of asparagus! So fresh and with a piece of crusty bread – best dinner ever! This is my friend Marco who lives in Roseto… with his little handful of mountain grown asparagus he picked just recently! I think he’s a little better at finding it than we were back then! Isn’t it amazing that people “nowadays” can still live a little off the land? I mean really, why waste space in your garden growing asparagus when you can pick it wild? and there is PLENTY to go around! So today… I just thought I’d share was a beautiful spring day is often like in Roseto Valfortore! It’s all about the food… all the time! and when it’s fresh… it’s best! What is the Gargano you ask? I'd like to share a bit of what I just sent out in my newsletter. This is one of the beaches we go to when I take groups of people to Roseto! The Gargano is the "spur" at the top of the "heel" of the boot of Italy in the region of Puglia. This beautiful picture is not of Amalfi or the west coast of Italy but from a beach called Mattinata which is on the Gargano. 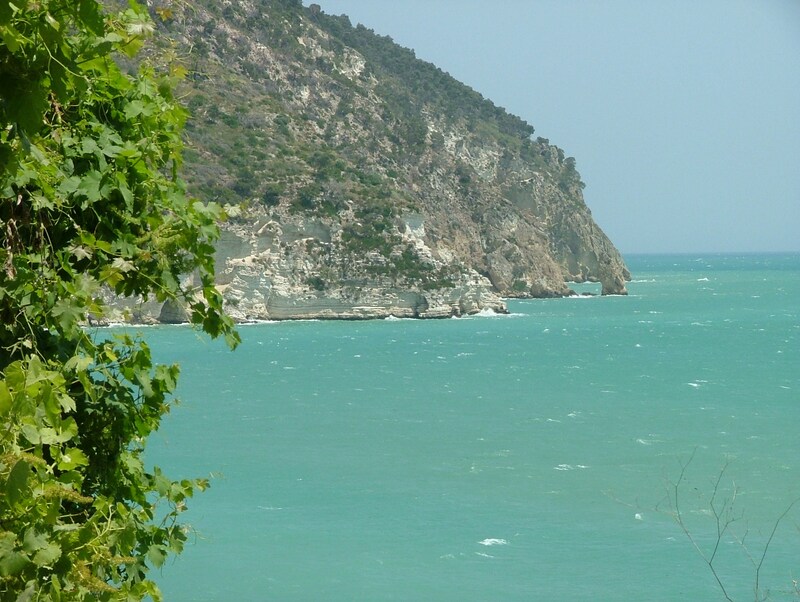 Most of the Gargano is part of the Gargano National Park in the central part of the spur and then there are the glorious beaches surrounding it all!Besides Mattinata, there are other beaches such as Vieste, Peschici, Rodi Garganico and so many more along the whole coastline! What sights to behold! You can also visit the Shrine of Padre Pio in San Giovanni Rotondo. It is the 2nd most visited Catholic Shrine in the world. (second only to Our Lady of Guadalupe in Mexico City) . This is where San Pio (who was made a Saint in 2002) served most of his life. He was known to have many mystic abilities including prophecy, miraculous healings, personal visits from Jesus and Mary and more. It is a beautiful and holy place to visit. There is also the Santuario di San Michele Arcangelo... The Sanctuary of St. Michael the Archangel. An absolutely beautiful shrine dedicated to where St. Michael appeared in the cave below. and cavatelli and also known for taralle and caciocavallo cheese. Don't know what these are? You can see some homemade cavatelli on my Dorina's Kitchen page on FB... as well as many other pictures of the area and its foods! And maybe soon you can see the recipe on a blog post here or even on video! Don't forget the Puglia region when looking into travel in Italy. It's the least known region to visitors but ever so lovely and a great secret... You see...it's where the Italians go! Zeppole/Sfinci –All for the sake of San Giuseppe- aka St Joseph! In my life growing up, my Nonna would make Sfinci every year for the feast of St Joseph. Sfinci is the Sicilian term for what a lot of other Italians call Zeppole. We have a lot of Joseph’s/Giuseppes in the family. My great grandfather was Giuseppe and on down the line, my Uncle Joe, My cousin Joe, My son Santino Giuseppe, and then of course my husbands Uncle Joe and so on back in the family line! In Italy, EVERY feast is celebrated with a special food. This is one of my favorites. I guess it just reminds me of being a kid at Nonna’s house while she was making them! So… Sfinci are always these little dough balls and zeppole are sometime just like this or another pastry that is piped in a circle and filled with cream. Either way this is about the “little fried balls” or “Sicilian donuts” as some people refer to them as. (but BOTH forms of this bite of sweetness are amazing!) . All over Italy you can have the same tradition for a food but each region, province or town will put their own spin on it. So I make these every year on March 19th and sometimes I make them just to have a little sweet treat. Everyone loves them and they are SOOOOO easy to make! Now if you put yourself out there you will find a million different ways to make them. Some recipes call for yeast and some use eggs as the leavening. Others use potatoes or ricotta in the dough and there is also a simple more modern way to get away with making them and that is with baking powder which of course is a quicker method of leavening. So I urge you to try this by …. say… this weekend!!! You won’t be sorry and your house will smell like a donut facory! Before I get into this too deeply, my nonna just mixed stuff together. I learned to “eyeball” it too… so this is an approximation of measurements. I think you’ll get it though!!! Per each 1 cup of flour use a heaping teaspoon of baking powder. They should come out a beautiful golden color. Place them on paper towels right away to drain and while still hot roll them in either powdered sugar or granulated sugar. I usually have a bowl of each and alternate batches in the sugars! Gotta have both kinds at all times since these things disappear every time you turn around to work on the next batch! Might as well let them have both kinds!!! I gave up a LONG TIME AGO trying to not let people eat them all while I was cooking them… the fact is… they taste best at that moment when ALL the senses are heightened! You are smelling the dough in the hot oil, feeling the warmth of the stove, getting the sugar all over your fingers as you eat them hot and then there is the feeling of warmth and love…. SO… why do we make these tidbits of hot sweet doughy perfection? Like my kids say…Out of Love of course! In the future I will post some of the other recipes for these babies but until then… start cooking! Back in November I was in Sacramento California to teach a cooking class. As I looked out the window of my friends house where I was stayin, I saw all these lemons hanging over the fence from the neighbors tree! When I asked if they picked them, and when I was told no, I went crazy! Are you kidding me??? If I had Lemons I’d make LImoncello!!! …every other day!!! haha! Needless to say, I came home with a whole suitcase full of fresh organic Lemons that I picked myself off that tree! And of course I had to make Limoncello!!! You need 6-8 lemons per 500 ml of alcohol. Peel the lemons with a peeler…just getting the outer yellow layer. It’s very thin…You don’t want any of the pith (white part) it makes it bitter. Put in a glass container(I used one of those GIANT Mason jars) and keep in a cool place for 30 days. Give the jar a daily shake! After 30 days mix 600 grams sugar and 750 ml water….heat to boiling. Once it boils turn off heat and let cool. You now have a simple syrup. Mix this syrup with your lemon rind and alcohol mixture and let sit with daily shake for another 40 days. After day 40… Give it one last shake… Strain out the rinds and pour into your bottles. Done! I used organic sugar in mine which is not white, it has a slight tan color. SO my limoncello that is now ready to drink isn’t as lemony yellow as other limoncello… it’s more a sunflower yellow. Well let me tell you-it still tastes GREAT! FYI- Limoncello tastes best ICE COLD so keep a bottle in the freezer! Every year at Easter my Sicilian Nonna would make these cookies for all 10 grandchildren. She’d go house to house to deliver them to all of us. She’d make them in different shapes like “bunnies” with raisins for eyes for the kids and then some shaped like a “basket” or simple round ones she called a “nest”. They were simple and just sweet enough. I loved scraping the cookie off the egg shell with my teeth!– I wanted every last bit before I shelled the egg! So here is the recipe. I hope you start a tradition of your own or are able to revive one you knew yourself but never had a recipe! These are great as they are or with a nice cappuccino to dunk the bigger pieces in that you break off the egg! What a GREAT breakfast! This is a very easy recipe and just plain fun to make! Mix the butter and sugar. Then add the eggs one at a time. Add the vanilla. Mix the dry ingredients together then add alternating with just enough milk till all the flour mix is done and you have a nice not too sticky dough. Form the dough around raw eggs(they will cook in the oven!) with one larger “rope” of dough then take a little piece and circle the top around the egg for a nice little frame. Of course this is how my Nonna did it. Yours may have done it differently and please do it your way! There are so many shapes and designs you can make! To make the bunnies just overlap the “rope” at the top to make ears. Pretty simple. If you look at the picture you can see the detail. To make a basket just make a “handle” on the round shape! Now take one egg yolk and mix with spoonfuls of milk and brush over the cookie for a little shine! Decorate with sprinkles or raisins or colored sugar(it will stick to the egg wash! )… follow your own families traditions or make your own! Baking time depends on size of cookies, but I usually go 350 for a good 20-25 minutes but once they are golden on the bottom then they are done. You don’t want them too hard. So please test your oven and come up with your own exact time! And YES the egg cooks in the oven! Enjoy and please write me if you make them! I want to know how they turn out! Washington DC Travel and Adventure Show! Come see me at the DORINA'S KITCHEN BOOTH #800--- where you can enter to win some COOKING CLASSES or a FREE 3 day extension on any booked Cooking Trip to Italy in 2018! I will also have some giveaways so come on down! COME LEARN ABOUT THE ROSETO EFFECT!!! Who ever heard of Italian Chili? I’m a member of the Maryland Business Connection Networking group and they held their Annual Kick-off Event which was a Chili Showcase and Coat Drive on Thursday. It was a great success and they collected hundreds of donations! Well I wanted to set up a table to promote my cooking classes and trips to Italy… but then I thought… why not make some Chili and be part of the event that way?!? The only problem here is that I am trying to promote ITALIAN cooking and trips… Chili isn’t really on most Italian menus! Well, anytime you are part of a showcase or contest where everyone is making the same dish the one thing you want to do is stand out and be different. SO.. I decided to make ITALIAN CHILI! What a fun event! People asked me what made my chili Italian…of course the smart aleck that I am replied “I made it! I’m Italian!” OK- OK- after a few laughs I’d then explain what I put it in to make it Italian. Well people kept coming back for more so I guess it was pretty good! Now as I give you the recipe here… I have to share a secret. I have never made “Italian Chili” before! In fact I made it up the day before the showcase! You might ask why I’m telling you this as most people want to come off as experienced in everything they do. Well, I am experienced. Experienced in cooking. The reason I find such joy in teaching people how to cook is just this. When you know flavors and textures and meats and vegetables and such, you can just cook something up without a recipe. My life has been like an episode of chopped every day for over 20 years!…especially with my 6 kids! Open the “basket” and see what’s in the cabinets or refrigerator and MAKE SOMETHING GOOD! I find such enjoyment whipping something up out of “nothing” and seeing happy faces around my table. So here is the recipe I just made up this week. I hope you enjoy it as much as the 300 people who tried it did! I guess I can now say this is a tried and true successful recipe! Brown the beef. Drain fat. Boil sausage to get all the fat out! Then peel skins and break up. While meat is cooking, dice/chop peppers and onions and garlic and saute in another pot. Once both are cooked mix together. Add beans. Add everything else. Let cook until everything is cooked and melded together. Serve with mozzarella cheese on top and Italian bread. You could also treat it like a spicy bolognese style sauce and serve over pasta! I bet THAT would be so good! Enjoy! And please come back and let me know what you think! Ok let me start by telling you that “lentils” is a word I did not know growing up. It was Lenticchie (pronounced len-teek-yeh)…I only knew the Italian word. My mamma would make some kind of smaller pasta with the lentils and lots of garlic. Yummmy! This is such a simple dish it is almost embarrassing to call this a recipe but you have to make this sometime. It is a simple, stick to your guts, garlicky and yes, a HEALTHY southern Italian peasant dish!!! First…rinse your lentils and then put them in a pot and cover with water….OK now this is hard…I usually use my 3 quart sauce pot and fill it about 1/2 way with water and I use a one pound bag of lentils! OMG!!! I feel like my old Italian Grandmother trying to pass on recipes that have no measurements!!! Of course you may not use that much since I do have a family of 8 to feed and that one pound bag and 2 pounds of pasta JUST covers us! So for a family of 4– 1/2 a bag is good with 1 pound of pasta! of course because nowadays all my older sons want more protein, I often go pound for pound… lentils and pasta! ***Anyway, bring the lentils to a boil and then just let them simmer slowly til they soak up all or most of the water (which you have lightly salted). If they dry out and aren’t soft then just add more water and take note for next time! In the end, you want the lentils soft and for the whole pot of them to still be kind of moist. Even a smidge watery is fine. ***Now in your other pot, boil your water for your pasta (with a good pinch of salt) and then cook the pasta. I like to use either a smaller pastina like ditalini or elbows, or acini di pepe or the mini bows…but I have also used the big bows, or rotelle, or even taken spaghetti and broken it into 1 to 2 inch pieces and used that. Use what you like or whatever you have on hand! ***Once the lentils and the pasta are both cooked drain the pasta then mix the two together. Now here is where I do it a bit different than my mother used to do…and of course you can do it either way. My mother used to take a bunch of cloves of garlic and throw them in with a bunch of olive oil and mix it all up. Let it sit for a bit and then serve. She likes hers a little more “watery” than my nonna used to make it. I like it this way but I also like to take a small pan ( I have the coolest little miniature cast iron frying pan ) that I heat up olive oil and lightly saute my garlic before throwing it in. I usually do this step while the pasta is cooking. I saute in a bit of regular olive oil but then I mix in with the pasta and lentils and add extra virgin olive oil. ***I like to serve this with grated parmigiano or romano cheese or even take a slice of provolone and lay it on top and it melts and gets gooey and is just another amazing variation! Please let me know what you think of this one!!! Here is my recipe for the Lemon Ricotta Cookies as promised before I went off on Buongiorno! These are very simple cookies that you will keep popping in your mouth they are so good! They are light and cake-y which I don’t always like in a cookie but with these it’s a whole different level of cake! Cream butter and sugar and eggs. Add dry ingredients that have been mixed together. Dough should come together but will still be a bit sticky. Roll dough into 1 inch balls. They really puff up so I usually flatten the balls into little disks. They don’t spread much so you can easily get 18 on a cookie sheet! Then add just enough milk or even water until it’s a glaze. You don’t want it too runny yet not as thick as icing! It will be drippy but not watery. I hope that is a good enough description! haha! When cookies are done let cool enough to handle then dip in glaze. Only glaze 4-6 at a time then top with sprinkles. If you glaze too many at a time, the glaze will dry and the sprinkles won’t stick! Let glaze dry completely before putting in tins or containers. You need to put these in something so you can hide them easier. If you leave them on a plate they will be gone before you turn around! Every time I pass on this recipe, everyone complains that there are never enough! This recipe makes a good 4 trays at least (50 + cookies! )… and I ALWAYS double it!